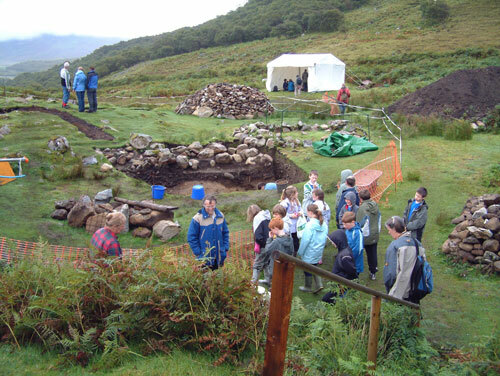 Despite some unsettled weather through September, the Open Days held at the High Pasture Cave attracted a good number of visitors including organised visits from primary schools from Skye and the adjacent Mainland. Including the schools, we had at least 320 people visiting the site over the four days. The Open Days attracted people from the local communities of Skye and Lochalsh, Inverness, Aberdeen and Edinburgh; while holidaymakers visiting the area accounted for most of the visits to site. 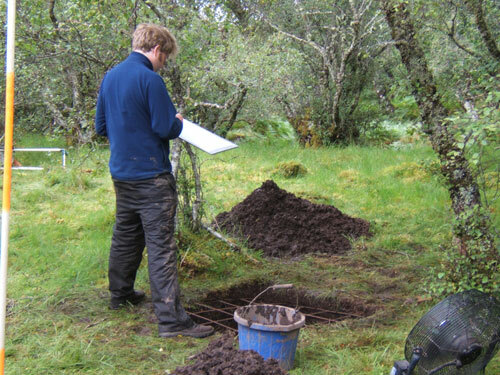 The archaeological excavations were in full swing during the Open Days and we were fortunate to have a good core of volunteers. This allowed excellent progress to be made on site, while also allowing us to provide the usual guided tours of the archaeological remains. 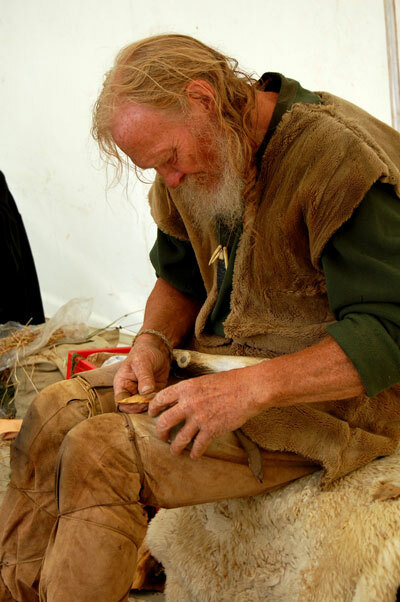 Once again, John and Val Lord provided their usual excellent demonstrations of prehistoric craft skills including flint knapping, bone and antler work, cordage manufacture and fire-making. 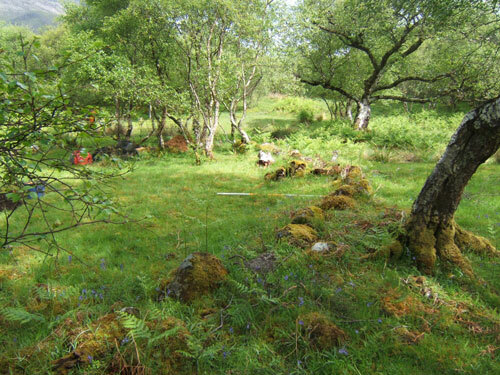 In particular, John and Val’s prehistoric skills proved popular with the school children and we had organised visits from Sleat Primary, Borrodale Primary and Lochcarron Primary. 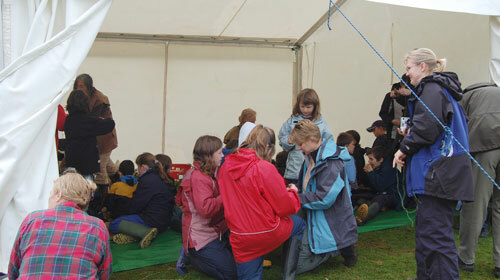 After a guided tour of the excavations, and after taking a look at a some of the most recent finds from the site, the children moved on to the marquee where they soon joined in with the prehistoric activities. 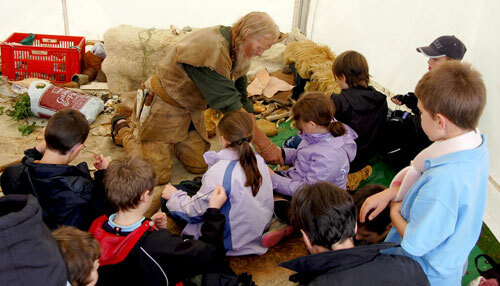 The images above and below show some of the school children and their teachers with John and Val, taking in the different forms of prehistoric technology. A big thank you to Duncan Aitken of Livingston, one of our regular volunteers on site over the past few years, for providing some of these images. The children enjoyed manufacturing bracelets from nettle fibres and animal sinew, while a few had a go at making a flint arrowhead. Fire-making using a bow-drill also warmed things up on site, with chants of ‘burn, burn, burn’ ringing out over the site. Eventually, a cloud of smoke from the marquee signalled that the demonstration had been successful. However, it was the spear-throwing that attracted the most interest. 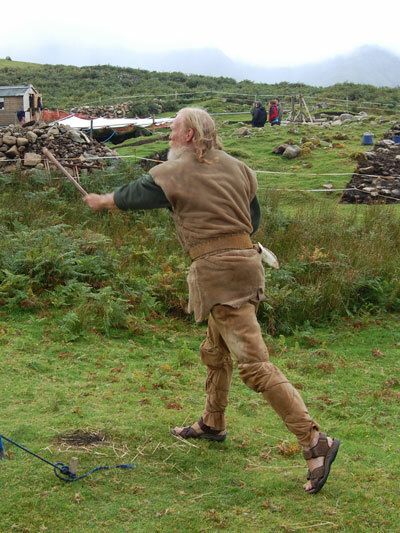 John showed the children the use of a spear-thrower, propelling the spear towards a target mounted on one of the spoil heaps. Direct hits were scored on several woolly mammoth and the teachers joined in to the delight of the children. The image above shows John Lord launching the spear using the Atlatl or spear-thrower. On the Saturday of the Open Days we also tried our hand at cooking meat and vegetables in a fire-pit. We dug an oval hole in the ground off-site and lined this with flat stone slabs. A fire was then lit in the pit and fuel added for the next two and a half hours, during which time we also added stone pebbles and small lumps of rock. Once everything had got quite hot, we quickly removed the ash, charcoal and stones from the pit, then placed in our meat and veg wrapped up in leaves and moss. The hot stones from the fire were placed around the meat and veg parcels, then moss and cabbage leaves placed over the top. Then we piled the soil from the excavation of the pit over the top and waited for just over three hours. When removed, the meat and veg were found to be well cooked, although the meat was still succulent and tasty!! Their were plenty of volunteers and visitors to site willing to try the food, which appeared to be enjoyed by all. Here’s to having another go next year......May we take this opportunity to say a big thank you to Ann and Mike Kibby, Tom Elliot, Susan Walker and of course John and Val Lord, for making the event so successful. Also, we wish to acknowledge the support and funding for the event provided by ‘Highland 2007’. How are things going in the real world? A beautifull sunny day at HPC with two red deer watching us all day (that’s for Tom). Trench 14 is now 1.8 meters deep with a tank (perhaps) and a nice hearth. (George is sleeping in there now). Steven and I are drawing the final sections and plans before we cover up for the winter. Just two open days at the weekend and we are finished for this year.